Heat radiates off the metal siding roof just above our heads, searing our hair and humming in our ears. Oliver’s opened the porthole windows at either end of the attic and placed fans to pull in the July air, but it doesn’t help. The fan’s fluttering ribbons only taunt us. I can smell us, perspiration mixed with the sweet, piney scent of car air fresheners. Mom’s hung dozens from the rafters, always adding a few every time she dares to come up. These two have birthed an impossible odor that’s sure will follow me like a stray dog for a few days. “How far out have you gotten?” I can tastes us too. Breathing though my mouth may not have been the best idea. Oliver points to a large sheet of cork board nailed on the sloping roof above his workbench. Pinned to it is a rainbow of small colored slips. I look more closely. There are dozens of them, these ‘call cards,’ each personalized with different colors and cartoons: KJJ58 Cleveland TN is a red hound dog; K88MR New Port OR a pelican, KJH09 Jerome FL a black and white pirate flag. A stack of Oliver’s own cards, KP787, carefully written in sweeping black calligraphy, sits on the workbench beside a soldering gun and several old vacuum tubes. A vintage radio, the current centerpiece of Oliver’s world, rests behind everything. It looms large as a mountain, it’s knobs and dials almost forming a Gomer Pyle smile, all white teeth and large, loving eyes. They say that old computers-the oldest ones that ran off punch cards and the meticulous natures of their programmers-could fill rooms. I wonder how huge old radios could get. “Where’d you get the new one?” I ask. The radio’s grin seems to widen; it loves being the center of attention. Ham radio? Hot girl? 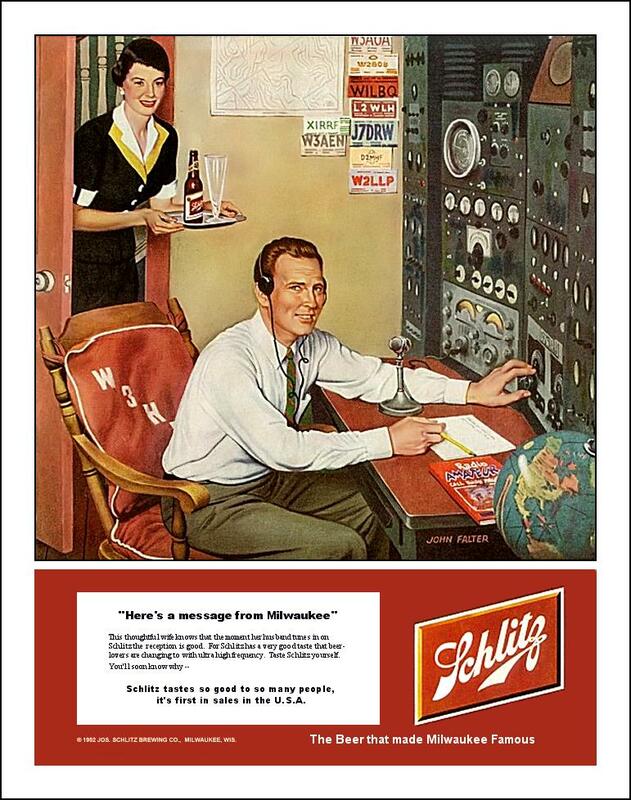 A Schlitz is just icing on the cake. I watch him under the dim glow of the attic’s only light bulb. He has the look of a hipster (minus the hip part) with his Buddy Holly glasses containing thick coke bottle lenses, and his plaid shirt tucked tight into his blue jeans. His carrot red hair (a mutual curse we’ve inherited from Dad) is slick with gel and parted to one side. June calls him Opie and for more than the obvious reasons. Oliver belongs to a different time, decades past, when he could’ve enjoyed hardware that didn’t run on apps but good old electricity. He would’ve been able to find others like himself, those destined to design and launch the Saturn V rockets and the Mercury space capsules. He may have even been popular instead of a loner, though the thought seems insane. “It looks neat.” God, we’ve become our own after-school special! And to think that Mrs. Jane put me up to this. After Mom’s nagging, Opie has already seen her once. She hoped to get him out of his shell and out of the attic, but all he did was talk Mrs. Jane’s ear off about the wonders of Morse code. He just needs a friend, Jane said. Maybe. But who doesn’t need a friend? “Where’d you learn to make the antenna?” I ask. And we do listen: numbers and letters called out, a pawn taken and a king checked. The occasional smirk crosses Oliver’s face at some inside joke. “Do you play with them?” I ask. Greg H. moves a bishop and takes a knight. Oliver, his back too me, is lost in his work. I lean forward and let the ribbons touch my nose once, then twice. The sun has already set, but the humid, twilight air is still too warm to give anyone any relief. This entry was posted in American Angst: Journal, Home and tagged diary, Diary teenager radio ya, June Bug, Oliver, teen. Bookmark the permalink.